If you have always wanted a straighter smile, you have an alternative to traditional metal braces. Invisalign has quickly become the preferred orthodontic treatment among both patients and dentists. Invisalign is a discreet treatment that uses clear aligner trays instead of wires and brackets. As a result, you will have a nearly invisible treatment while getting the straighter smile you have always wanted. As your dentist for Invisalign in Naples, Dr. Mark M. Makram recommends Invisalign to his patients due to the exceptional benefits the treatment offers. Traditional braces use wires and brackets to pull the teeth into their correct alignment. This form of treatment has been a common practice for decades as it’s effective. However, while it is affordable and effective, there are certain downsides to the treatment. Treatment time with metal braces can be lengthy. Not to mention, there are multiple restrictions that must be followed and there is often discomfort and irritation. You also require multiple visits to the dentist for adjustment as your progress through the course of the treatment. Invisalign produces the same results as traditional braces without the headache and hassle. 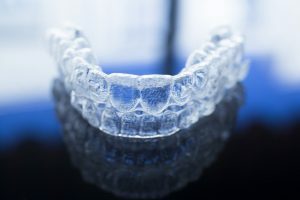 Invisalign uses clear plastic aligner trays that are worn over the teeth. The trays are custom-made to gradually move the teeth into their correct positions. A series of trays are created, with each tray in the series worn for about two weeks. After the two weeks, you switch to the next tray in the series right from your own home. On average, it takes about 12 months to finish the series of trays for a straighter smile. Since removable aligner trays are used instead of wires and brackets, Invisalign offers many benefits when compared to traditional braces. In addition to a less noticeable treatment, the length of treatment required is shorter and more convenient. You’re able to progress through the treatment right from your own home. There is no need to come into the office to have adjustments made. However, you will still need to see your dentist every few weeks so we can monitor the progression of the treatment. Invisalign also offers more comfort than traditional braces. The smooth trays don’t cause irritation to the lips or the cheeks and there’s no tugging or pulling from wires. Not to mention, there aren’t any food restrictions and oral hygiene is easier because you just take the tray out. For those who are interested in braces in Naples, many now turn to Invisalign. As a dentist who strives to provide comfortable and personalized care, Dr. Makram recommends Invisalign to his patients. To benefit from Invisalign in Naples, you will need to undergo a consultation to determine if the treatment is right for you. A customized treatment plan is then developed to give you a straighter smile without the embarrassment of metal braces. If you are ready to get the straight smile you have always wanted, it’s time to choose the treatment dentists prefer with Invisalign.